I have been toying with moving this blog to WordPress for years. Each year, I think about it. I tell myself, everyone is doing it, I probably should too. Wait a minute . . .if my most compelling reason to move is because everyone else is - that's no reason at all. I have never been a crowd follower, and don't plan to start now. So after thinking long and hard, I've decided to satay right where I am, with a pretty new look (you may have noticed) all thanks to the hugely talented, smart and funny Elle at Pink Flame Designs. Almost every Blogging group I belong to, conference I attend and networking event I go to, say the same thing, "to be taken seriously as a blogger, you have to be on WordPress." I beg to differ. There are some wildly popular blogs with HUGE followings that not only are still hosted on the Blogger platform, but even use the blogspot URL - GASP! I own my content as much as anyone else - It's a myth that Google owns your content if you use their platform. If they owned your content, they wouldn't allow you to back it up or take it with you if you choose to leave. They may be a big company, but they are not the devil. They are simply the host - just like any other one out there. No matter who you host with, take time to read the TOS, you may just be surprised. I can put my money to work for my blog - Rather than paying for hosting, I'm putting that money directly into content improvement. Recently I went through a professional design update, and it was money well spent. Later this year, I'm attending the Type-A Parent Conference to improve my skills, meet my peers and spend sometime learning about brands. No one has ever asked me who my blog host is - If they want me to install a widget or something, they may ask my platform so it can be coded correctly. But NEVER before I was accepted for a campaign or opportunity. I hear a lot, brand don't take you seriously if you aren't on WordPress. That's a laugh since we know from the pitches we get that 8 out of 10 of them never actually LOOK at our blogs. 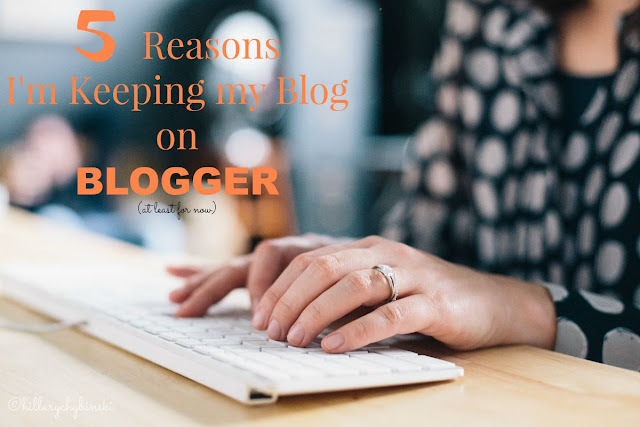 Hopefully, professionalism is based on the Blogger and NOT on the platform they run, because I have certainly seen my share of unprofessional WordPress bloggers. A Blogger blog can be pretty too - I mentioned my recent design update. Elle from EAE Design Studio did an amazing job of reading me. We started a secret Pinboard to share design ideas, and she hit it out the park with the first design board. Doing this design was a big deal for me. Previously I had tinkered around with the template myself, and frankly I think I did a pretty good job. I was getting pitches and opportunities and compliments on my blog. So rest assured, you can take your Blogger Blog to the "next level" too. I'm not spending my time worrying about Plug Ins - Time is precious, and spending time every day worrying about the latest hole in your favorite plug in or why your blog isn't working after the latest plug in update, is not a great use of time. Google (and Blogger) is pretty reliable. It may not be fancy, but sometimes, less is more - kwim? 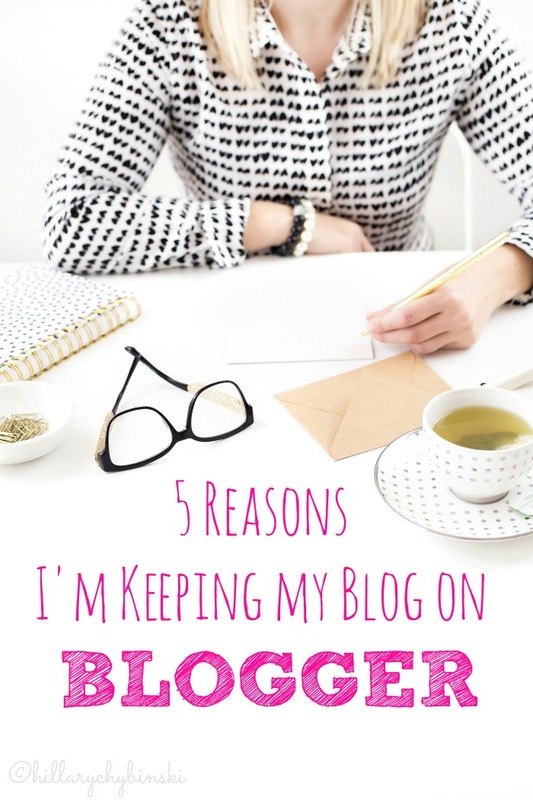 It really all circles back to number two, where I choose to spend my money on my business and my blog. A smart business person doesn't spend their money where it's not needed. I spend mine on workshops, conferences and tools to make my content better and to provide a better experience for my readers and followers. I conduct myself in a professional manner - I take this seriously, as it's my JOB. In the end, it's the experience you provide that matters, not what street you live on. I do love the new design! I think you're blog looks great! It's all about what you do with the platform you use. Yes yes and yes! If it ain't broke don't fix it. I love this Hillary and I think the new look is great. I'm the same way. It's about the cost. WP doesn't allow monotinizing on their free version. B does. WP is hosted through someone else's server, so is Blogger. WP doesn't own your content, neither does B. So far everything I admired about any WP blogs, I've been able to replicate, it is often just the vocabulary that is different. Plug ins vs gadgets... etc. Great post! Anything I've wanted to do, I've found a way to do it on Blogger.